When it comes to residential concrete, there are many ways concrete can be used to maintain and improve your home. 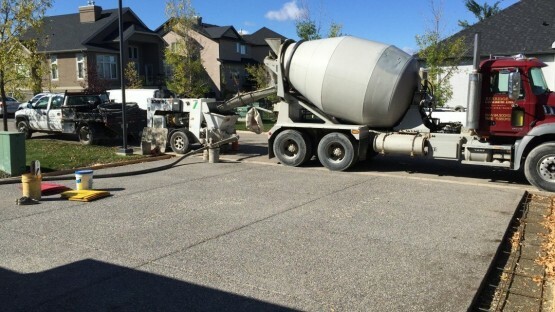 Edmonton concrete companies can install new concrete for your home’s driveway, pathways, patio and garage pad. It is also used for your home’s foundation and as pilings for your deck, fence posts and other outdoor buildings. Concrete is also becoming a popular finishing material for your indoor renovations too. Features like concrete floors and concrete countertops have become a home design trend in recent years. No matter what the application is, you can be sure that any concrete used around your home will be strong, durable and easy to maintain. 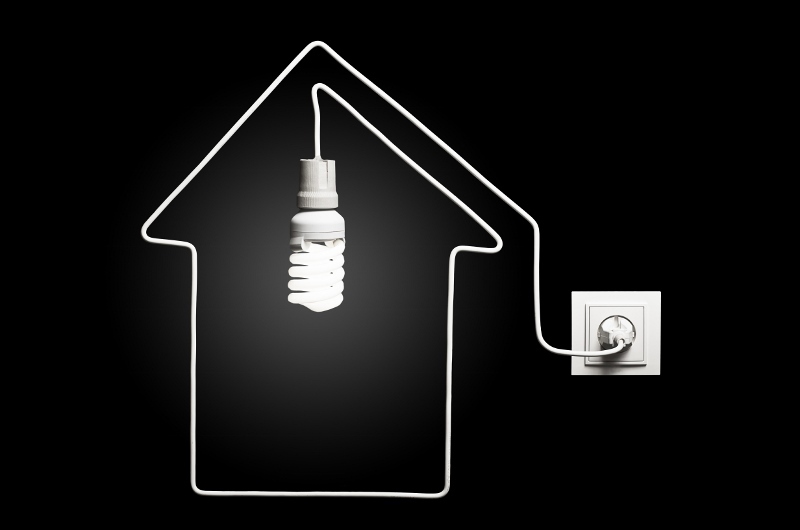 Plus, it can increase your home’s value. Concrete is made up of three main components: water, aggregate and cement. Many people think that cement and concrete are the same thing, but cement is actually the binding agent used to create concrete. Since it is so strong and durable, it is perfect for binding aggregate, which is typically sand, gravel or rock, to create a pourable concrete product. Once everything is mixed together, it can be poured into your driveway or into molds for your concrete countertop. You can get creative with the colour of your concrete by using specific kinds of aggregate. For example, some homeowners will choose to add a touch of style to their exterior concrete by using a red coloured aggregate. The aggregate used in the mixture can have an affect on the finished product’s shrink rate and how long it will take to dry, harden and cure. Have more questions about concrete? Learn the basics about concrete here. The properties of concrete as a building material. The physical properties of concrete make it one of the best building materials available and one of the most cost-effective. 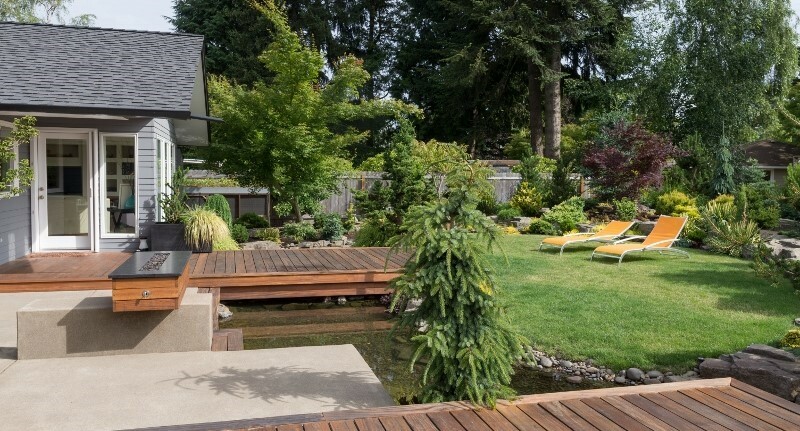 The concrete mix itself is very workable and can be easily poured into any mold or frame to create a variety of residential features like driveways, patios, countertops and retaining walls. 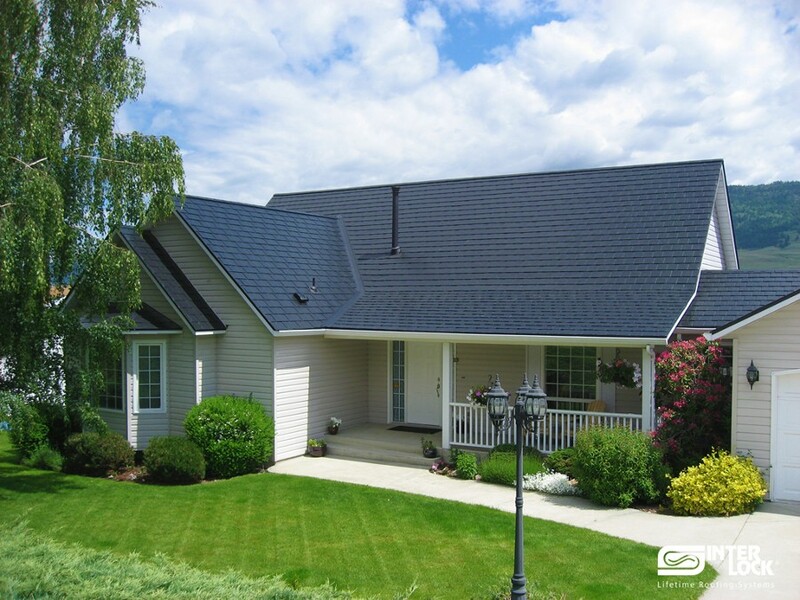 Beautiful new concrete used around your home’s exterior will improve curb appeal. 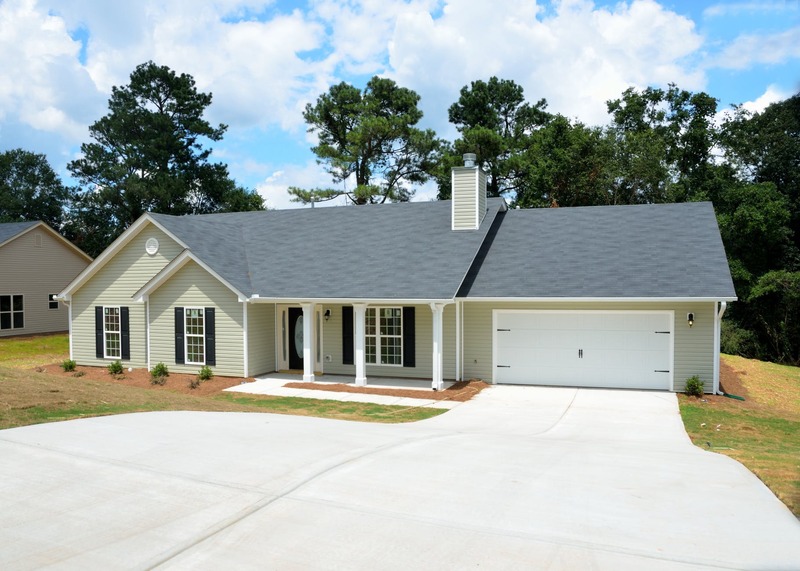 A brand new driveway, custom walk ways and attractive interior finishes using concrete all hold good resale value, making your home more attractive on the real estate market. It has low permeability, which means it can stand up to moisture. If sealed properly, it can be resistant to certain types of de-icers, so you can get rid of that pesky ice on your driveway in the winter time using sand, gravel or a calcium choloride based de-icer. Over many years it might start to suffer some wear and tear, but concrete is a material that can be repaired and even lifted to look like new again. Unfortunately, over the years, concrete will not stand up to the constant freezing and thawing we have in Alberta. This can cause your exterior concrete to crack or even sink. When water on the surface of your concrete saturates the pores on the concrete’s surface, then freezes and the ice will expand. When this happens over and over, year after year, your concrete will eventually suffer distress. Though it might take many years, even decades, it could cause your concrete to crack or crumble. Improper installation and finishing can also result in this problem. The process of installing exterior concrete. 1. Removal of the old concrete: First things first, they have to demolish and remove your old or damaged concrete. They’ll use heavy equipment to break it down and haul it off to be recycled. This helps prevent waste in the landfill. 2. Marking utilities: Before any excavation happens, underground utilities like gas, water and electrical lines will be marked. Alberta One Call will mark your utility lines for free. Cable companies often offer the same service. 3. Preparing the surface: Once the concrete is removed and the utilities have been marked, the area will be excavated and gravel will be packed down to create a layer between the ground and your new concrete. They will likely use equipment like Bobcats and mini excavators to do this job. 4. Bracing the area: A concrete contractor will put wood bracing around the driveway, patio and/or walkways where the new concrete will be poured. Rebar will be installed to ensure the strength of the concrete and they will use a conduit to protect any utilities that might run beneath the concrete. 5. Pouring the concrete: Now the area is ready for new concrete! A large concrete truck will arrive and the concrete contractors will spread it out, wipe it and finish it to perfection. 6. Sealing the concrete: Once the concrete has cured and everything is perfectly dry, the concrete company will come back and seal it for you. This will give it a long-lasting and protective finish. Save money with concrete repair and restoration. If your concrete has suffered damage, it might cause it to crack. In some cases, sections of your driveway or your concrete steps leading up to the front door can start to sink. Having concrete damage is unsightly and could diminish both your home’s aesthetics and value. If you are planning on selling your home, an attractive driveway and walkways will help attract more potential buyers to view your property and help you maintain your home’s value. 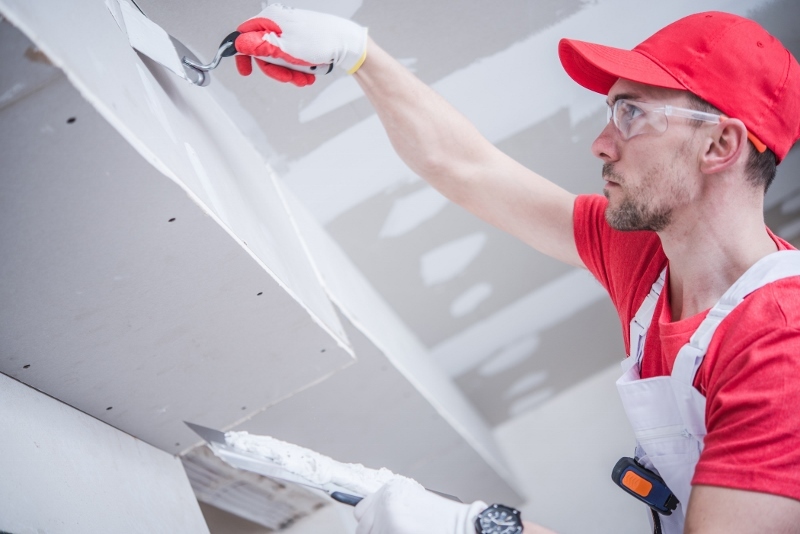 Regardless of whether you are wanting to sell your home or not, if you leave the damage too long the problem areas could continue to deteriorate and become worse. If you have cracks in your foundation, this can lead to water infiltration and some very costly damage. More than that, uneven concrete where people walk around your home can become a tripping hazard. Having that old concrete demolished and removed, and then having new concrete installed, can be much more expensive than hiring concrete repair in Edmonton. In fact, many concrete repairs can be offered at a fraction of the cost of a total replacement. Having your concrete restored will also increase your home’s value. One of the most common forms of concrete repair is concrete leveling. This process, also known as ‘mud-jacking’, is the method of lifting the sunken areas of concrete up by pumping a product through the concrete to push it up from the settled ground beneath it. The material used in this process varies, usually mud-jacking uses a sandy cement mixture but other companies might use a polyurethane liquid compound, similar to spray foam insulation, to create the pressure beneath the sunken slab to lift it. They call this ‘foam-jacking’. In both cases, the concrete restoration company will drill small holes into your concrete to make the injection. Typically, these holes are barely noticeable and when they are finished you will be left with a brand-new looking driveway! Protect your concrete with concrete sealing. If you want to reduce the chances of your concrete driveway cracking or sinking, consider investing in concrete sealing in Edmonton. This is when a protective coating is added to your newly poured or restored concrete to help protect it from the freeze-thaw issue. A concrete restoration and sealing contractor might use a polyaspartic sealer that will deeply penetrate into the pores of your concrete surface, making it more resistant to moisture caused by melting snow and rain. Concrete sealing will also protect your garage floor and driveway from chemicals, abrasions and harmful UV rays. These coatings are also ideal for protecting other outdoor surfaces like exposed aggregate, brick, patio blocks and can make your decorative concrete really stand out! The coatings are clear, will give your concrete a beautiful glossy finish, won’t yellow in the sun and will help boost your curb appeal. Most importantly, concrete sealing will help you prevent costly concrete repair or replacement in the future. Creative exterior concrete around your home. Concrete will take several days to cure, but it is easy to work with and very versatile when it comes to design and finishes. 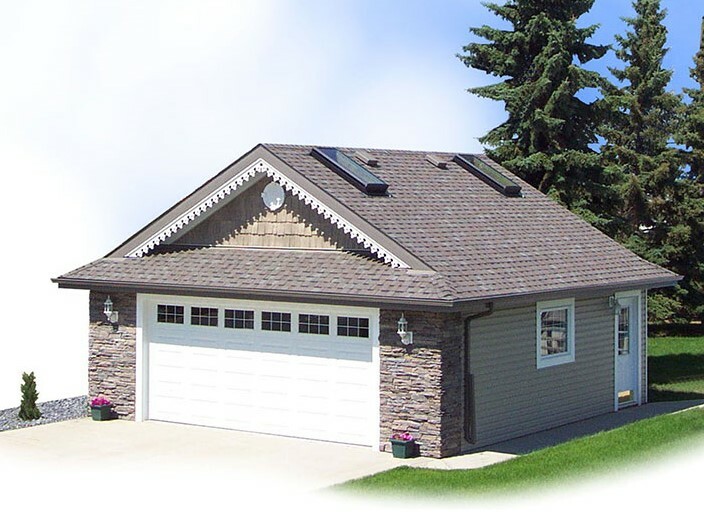 Concrete contractors in Edmonton can install your new concrete driveway and walkways with a standard white broom finish, leave the aggregate exposed to give a pebble-like finish or even show you options for stained, tinted or stamped concrete. Stamped concrete will have natural looking patterns imprinted in the concrete so it looks more like a natural stone like granite. 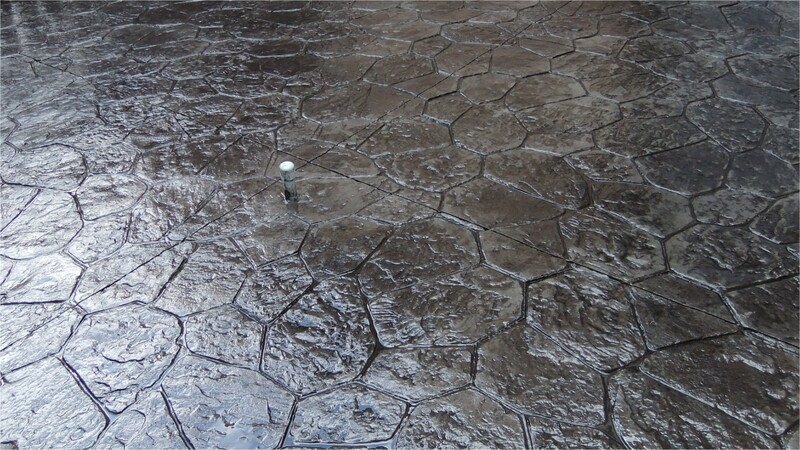 Using stamped concrete instead of stone tiles will be much more affordable. Though it’s usually a job best left to the pros, avid DIYers can learn how to stamp concrete themselves. Polished concrete is when a high-gloss finish is installed on your interior concrete. This is a great option for interior floors as it can give the same look as a polished marble or other types of natural stone flooring. It is used widely in showrooms and retail stores. Stained concrete is when acid-based chemicals are used to stain the plain surface, making it look more earthy and elegant. Coloured concrete will allow you to enhance your home’s outdoor design using virtually any design you can imagine. Your concrete can have a reddish style like Spanish tile or be dark like slate. If you’re looking to upgrade your home, concrete can help your renovation dollars go a little further. It is a much less expensive building material to use compared to natural stone like granite or marble and it is easier to clean and maintain. Decorative concrete has great value. It can give your home that high-end look without that high-end bill! Learn more about how you can enhance your home with concrete design. Concrete used INSIDE the home. Concrete is quickly becoming a very trendy building material and is incorporated in contemporary interior design. From perfectly polished concrete floors and rugged concrete tile feature walls to custom-built concrete furniture and concrete countertops. In fact, concrete design has become so popular that many concrete contractors have moved their expertise from the front driveway into the kitchen and bathroom. Enhance your kitchen and bathroom with concrete countertops. 1. They’re long-lasting. Your concrete countertops will be virtually indestructible. If they are sealed properly, they will be resistant to water, stains and heat. That means you can put a hot pot right on your countertop without worrying about it! 2. Concrete gets better with age. Concrete is not a static material. Some say it’s appearance only gets better with time as it evolves and acquires character over the years. 3. They can be made to fit any size or shape. If you have a tiny kitchen, an awkward space or a unique idea for a funky island in the kitchen, concrete is the way to go. A concrete countertop contractor can make a countertop to fit nearly any shape or size. If the area is large and needs to have seams, they will use colour-matched fillers to hide them. 4. Concrete countertops are incredibly versatile in design. Concrete countertops can be made in nearly any colour and texture. 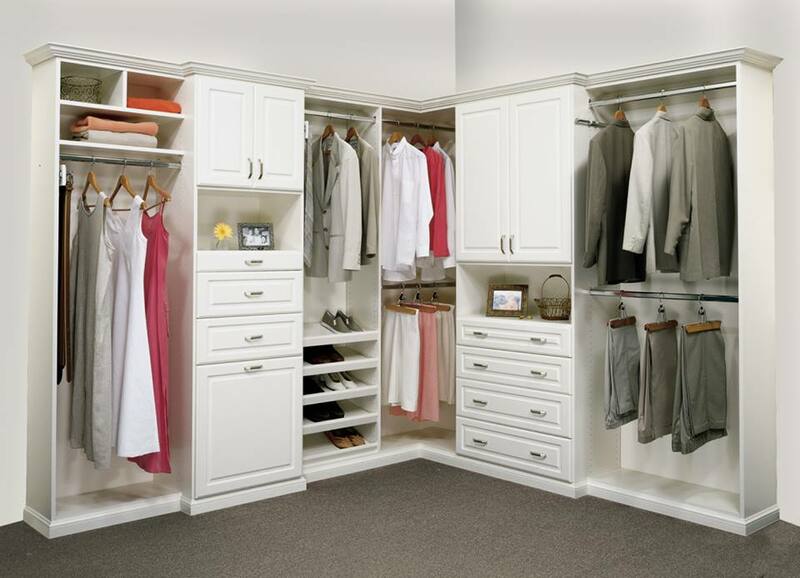 Choose from patterns like wood grain, smooth, speckled or veined. Some homeowners get creative with their bathroom countertops by embedding items like recycled glass or pebbles in them. 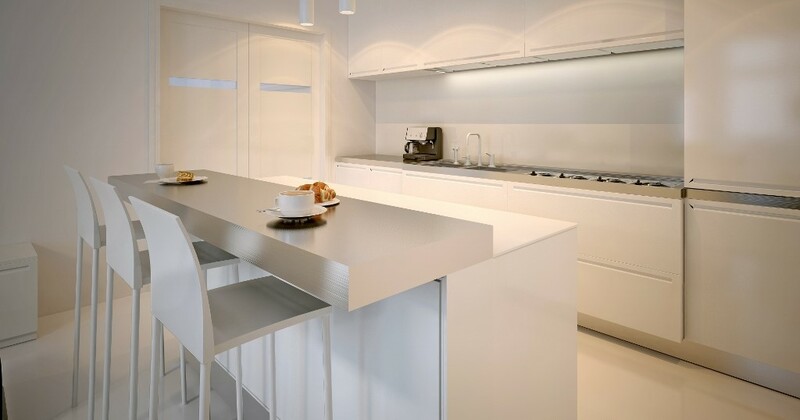 You can even have LED lighting embedded right into your countertops! If you have some great ideas for using concrete in your home’s interior design, contact a company that offers concrete countertops in Edmonton. 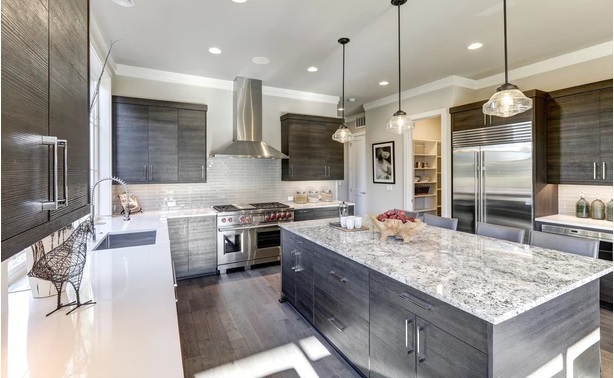 They can show you some of their previous work and help you design a kitchen or bathroom plan that will meet your needs for design, style and function. Custom concrete furniture and finishing. New technology and tools allow concrete contractors to become artists when it comes to concrete furniture and interior finishing. You can fill your home with custom made objects with a variety of colour and finishing options including smooth polished concrete and concrete that mimics the look of expensive natural stones to concrete that gives that worn-in and loved look. You can have concrete wall panels, concrete wraps for architectural pillars, concrete benches, coffee tables, planters, dining tables, fireplace mantels, outdoor fire tables, sinks, showers and concrete islands. If you can imagine it, a creative and talented concrete contractor can make it for you. Not only will your interior concrete furniture and finishing look incredible, it will also be strong, durable, easy to clean and maintain and cost-effective. Whether it’s on the driveway or in the kitchen, maintaining your concrete will ensure it stays looking like new for years to come. When you have new concrete installed, the concrete contractor will seal it afterwards. This is something you should do yourself every couple of years to ensure your concrete is looking like new. Cleaning your concrete driveway and floors regularly will keep them looking their best. You can use a pressure washer to blast away dirt, mold and debris. You’ll be surprised how much a good cleaning will improve the appearance of your concrete and your home. If you have oil and other spills on your concrete, use a basic degreaser to remove the stains. Do not let gasoline, oil and other spills sit on the driveway. It is best to clean them up as soon as possible so they don’t penetrate into the concrete’s pores. Learn how to clean concrete floors. It’s also a good idea to avoid using de-icing chemicals in the winter time. Although your driveway and pathways can get slippery in the winter, certain chemical de-icers and salts can damage the surface of your concrete. Keeping on top of your shoveling and using gravel or sand for traction is a better option. Like mentioned above, concrete sealing can also help preserve and maintain your exterior concrete. You can have your driveway sealed every other year or when the finish starts to show wear. This will protect your driveway from the freeze-thaw damage, highlight its design features and improve the look of your home. RenovationFind.com has a directory of accredited concrete contractors in Edmonton that have a proven reputation for quality products, workmanship and exceptional customer service. Like all contactors and trades listed on RenovationFind, these concrete contractors have gone through and passed our stringent screening process and are being continually monitored to ensure they are the best of the best. While each company has their own expertise, you can find a contractor to service all of your concrete jobs, inside and outside of your home. Whether you want to include concrete countertops in your kitchen renovation, have a new concrete driveway installed or are interested in concrete repair, contact RenovationFind Certified concrete contractors in Edmonton!